I resolve...a picture is worth 1000 words - Scarsdale Premier Insurance Agency | Advocate Brokerage Corp. I resolve to be more organized! As we have mentioned in previous blogs, one of the top resolutions made each year is to be more organized. One area where many people seem to be organizationally challenged is when it comes to having a record of items owned. 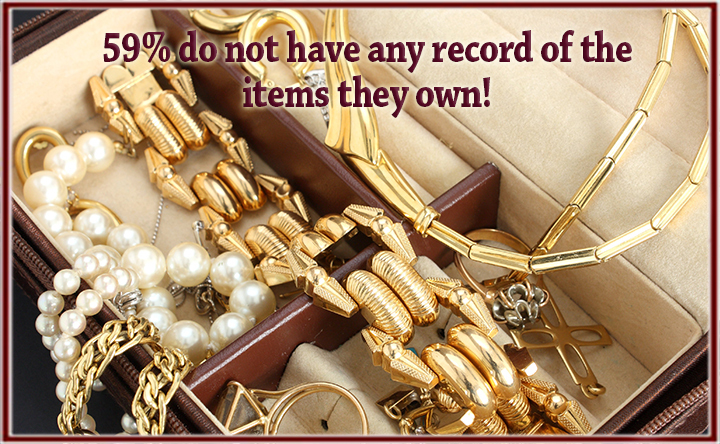 In fact, according to the National Association of Insurance Commissions, 59% of all people do not have any record of their possessions. Of those who do, 27% don’t have any photos and 28% don’t keep a back up of their lists. Team Advocate wants to help you reach your organizational goals by providing a list of tips to help you create an inventory of your belongings. Why do I need to make a list? The easy answer is, accidents happen, weather happens & theft happens. It gives you the opportunity to prove what items you own. It shows the condition of the items. It can help you determine if your current coverage is adequate to replace your stuff should they become damaged, lost or stolen. How do I go about making a digital list? Your inventory can be made up of either digital still images, videos or both. As you begin to take your photos, place a note next to each item which details the purchase price, date or even the receipt of the item. Do your best to angle photos away from mirrors or other reflective surfaces to prevent reflections and glare. In order to help substantiate ownership of your items, photograph a family member in the photo with the items. If you are inventorying big ticket items such as appliances or computers, add a photo of the serial number. If you are photographing china, include a photo of the back of the piece to include the pattern name and/or manufacturer’s signature. You can choose to store your digital record a variety of ways. If you are storing your inventory on a CD or flash drive, be sure to keep them safe. Place them in a safety deposit box or a fire safe. Do I have to take a photo of every single item I own? Group like items together. For example, open your closet doors to show the amount of clothing you own and then take individual photos of the items with considerable worth (furs or beaded gowns). Categorize your inventory room by room. Take an establishing shot of each wall of the room and then focus in on individual big ticket items. Start with your high end contents. Look to the items in your home that have the most value. We found this great infographic that answers this question beautifully!